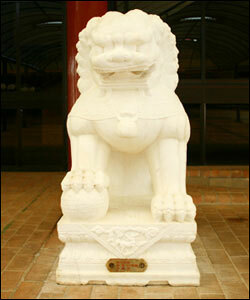 On either side of the stairs to the Dining Hall are large white Temple Lions. They are to be found at main entrances and gates around the Temple and are Temple protectors. They are mythological animals called Dogs of Fu, the miraculous progeny of a Pekinese dog and an African Lion. This is why they appear more dog than catlike. It is also the reason why both male and female have manes. The ball in the mouth is a symbol of trust. The lion will neither bite nor swallow the precious jewel, which is a symbol of life. The male has a ball under his foot demonstrating his protective power. The cub under the female’s foot shows her gentle, female quality and the vigilance of a mother who fiercely defends her offspring. It is believed that malevolent beings, seeing these strange beasts, will be terrified and flee. Hanging above the female, to the left, is a wooden fish. Traditionally, the fish hung outside the bathrooms. It was struck at set times during the day to call monks and nuns to their ablutions. This fish is just an ornament. Wooden boards are struck at the Temple to wake people and to call them to services and meals. Different patterns of hitting the board are used for different calls. The same signals that were used thousands of years ago are still used today.